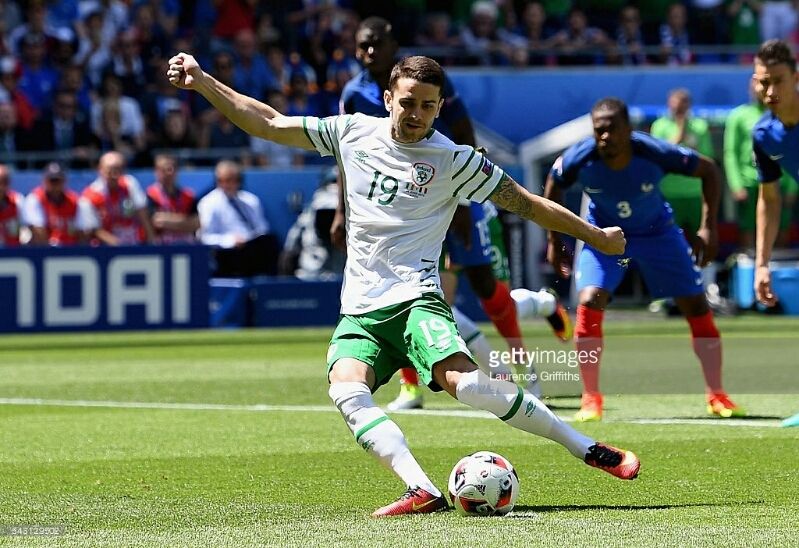 So Ireland’s journey in the Euros came to an end today in the last 16 against the hosts, France. It was always going to be tough but for a little under an hour we were dreaming of what may be as Robbie Brady gave Ireland an early lead. Brady, the hero in the last round against Italy, brilliantly stroked an early penalty to the French net to give Ireland something to hang on to. Last weekend Ireland was well beaten by Belgium but they regrouped and during the week a late Robbie Brady header gave Ireland the win they needed to progress into the last 16. After the defeat by Belgium, the victory over Italy lifted the team and country. This morning I was up early and with a new US friend I headed around to my neighbors house, a fellow Irishman from Kildare, to settle down and watch the match. We hadn’t even got comfortable when the referee pointed to the spot and Ireland had a penalty after barely 90 seconds. 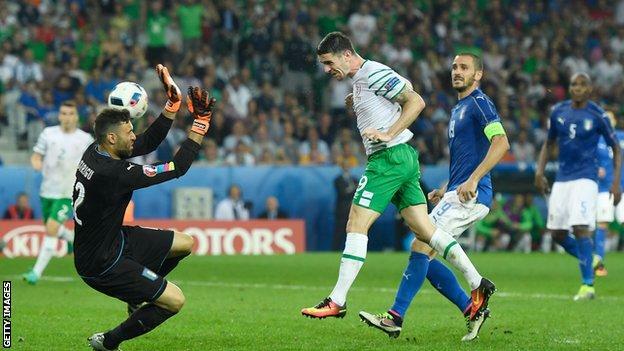 Up stepped Robbie Brady, and he scored to give Ireland the lead. Que celebrations but also knowing this French side aren’t bad so it was going to be tough. Ireland played great in the first half and could have had a second goal but it didn’t come. The half time break came, time for another mug of tea and take stock. Could we hang on, were we going to emulate Stuttgart in 1988, or would the French step up their game and hit back. Unfortunately, it was the latter as the French hit 2 second half goals to win 2-1 and our dream was over. This Irish team was written of a year ago, but they regrouped and fought to qualify, defeating Germany in the process. During the Euros we seen the best if this team in the draw against Sweden and the win against Italy. This was tempered by the defeat to Belgium, but we have a platform now to build on. Today we were beaten, we are out of the Euros, we are proud of the team and the future for this squad of players is bright. Thank you Ireland for a wonderful 2 weeks of football. As an added Postscript I woukd like to add that the Irish fans in France were immense, as always. Singing, supporting and partying away with no hint of trouble. They have endeared themselves to the French and the watching public. Just one thing, if just 10% of those that attended the games in France headed to a local League of Ireland match, the future of the international team would be secure. Coleman, Hoolahan, McClean, Ward and Quinn all played in the League of Ireland and it’s only with investment and fans will the next stars make the breakthrough.